It has been a year full of activities & expansion at % Arabica, and here are our top 10 favorites of 2017! One of the main aims of our brand this year was to source all the beans directly from the origins, and our founder, Kenneth and the global head barista, Junichi, spent so much time visiting coffee origins around the world. Seeing Ethiopia was mind-blowing, huge farms in Brazil were astonishing. We will keep visiting the origins as much as possible in 2018, in order to keep improving our beans quality, as there is no compromise over quality at % Arabica. Our global store #8, % Arabica Kuwait Roastery opened in March, with amazing facility accompanied with beautiful store design. In a short span of time, this store became the most popular % store in the world selling more than 2000 cups of coffee on busy days. In June, our global store #10, % Arabica Hong Kong Star Ferry opened, and this store has become popular instantly. With only 17m2 space, it is serving the highest number of coffee drinks per square meter among all of our stores. We dream to open stores like this all over the world, and we will work hard day in, day out to make this dream come true. In August, our global store #11, % Arabica Oman Al Qurum opened at the capital city of Oman, Muscat. It is a city full of history and has an ambiance of its own which we are excited to explore. Even though, Oman is yet new to speciality coffee, we are looking forward to growing the business together with our local Omani customers, who has shown enthusiasm to indulge in our coffee experience. As you may know, our brand HQ is located at the beach community, Discovery Bay in Hong Kong, and we need to take a ferry to go to Central, where is literally the center of all the business and trends in Hong Kong. After getting off the ferry, there is a prestigious shopping mall, IFC, and as much we love the place, we were very excited to have our store there. 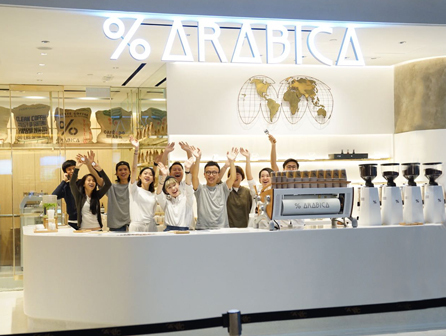 In November, we opened our global store #12, % Arabica Hong Kong IFC, which is the first store while going into the mall from the ferry pier. At this dreamy location, we will strive hard to serve the best coffee we can to satisfy the most sophisticated coffee drinkers in Hong Kong. 8. Paris, Here We Come! Store design by Puddle Inc.
As of December 2017, we have our stores running in Japan, Hong Kong, Kuwait, UAE, and Oman. And in 2018, we will open in Philippines, China, France, Germany, Saudi Arabia, Bahrain, Qatar, Morocco, Indonesia, Egypt, Jordan, Lebanon, Singapore, Turkey, UK and USA. We are greatly honored and humbled that our brand has reached at this amazing stage, with your kind support. To conclude this amazing year, let us promise you all that we will keep working hard and improve with every passing day in 2018 to make this brand even more special. Let’s see the world through coffee.